The seventh graders have been learning about the most common sport injuries and means of prevention. 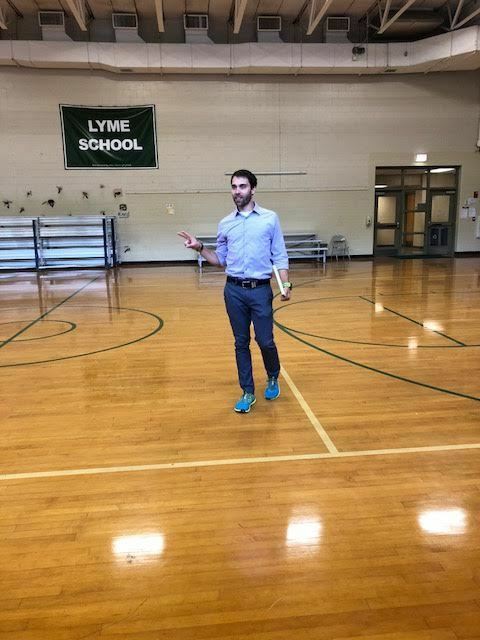 This week, we were fortunate enough to have Lyme newcomer, Mr. Kevin Stanton, PT DPT as a guest speaker in our health class. He shared the nature of his job, the education needed to be a qualified and licensed PT DPT, and the different exercises that can be done in order to prevent injuries. Kevin demonstrated the dynamic warm up, plyometrics, and proprioception. He explained how performing these for 20-30 minutes a day can drastically reduce the chance of knee injuries, in particular. Our community certainly has an abundance of resources in many areas, and now we have Kevin as a new member of the Lyme community. We are certainly grateful for his time and the knowledge he shared with us this week. When Kevin is not mountain biking around the Upper Valley, he can be found at BE Fit: Orthopedic and Sports Rehabilitation Center at the White River Junction, VT location.